We had dinner with some friends last night who live in Singapore now, but are back in town for a few weeks. They were asking how the bees were and that they follow my blog from Singapore. I thought wow, that’s so cool that someone on another continent follows what I’m doing. I’d better post something! (Plus I just got my renewal notice for the domain, so I better get my money’s worth). The girls are doing okay, especially BuddhaAndTheBees #1 (BnB1 – the yellow hive started in 2013) which I thought wasn’t going to make it. They’ve got comb out to bar 18 and are making honey like crazy. 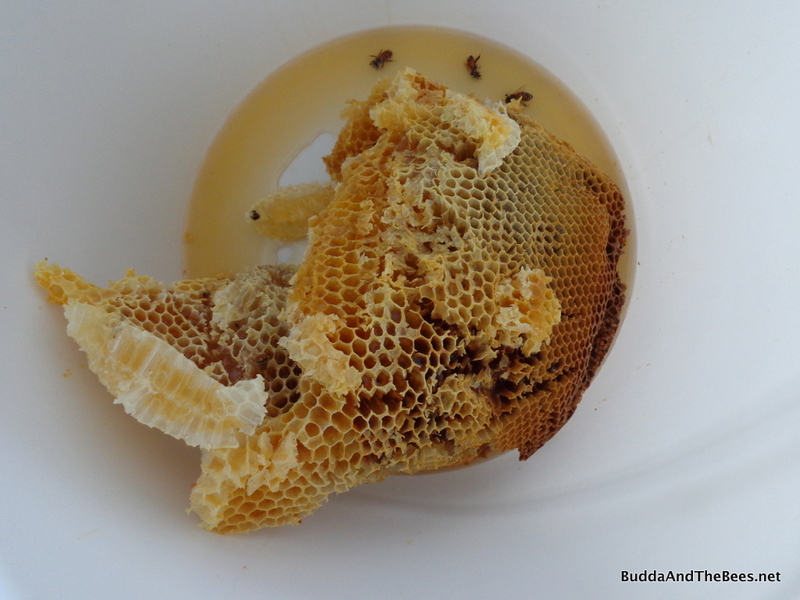 BuddhaAndTheBees #2 (BnB2 – the blue hive started this year) has built out to bar 14 – a little slower than I’d like and are just starting to cap some honey. Both hives have lots of bees and the queens seem to be laying well. I know that BnB1 and BnB2 are not very creative names, but they work. I follow another beekeeper’s blog and she names her hives after queens from history or mythology. That’s pretty creative and her hives are artistically decorated. As I’ve said before – I’m not very creative or artistic – I’m an engineer and these names work for me. Plus it’s a play on the bed and breakfast idea – the girls eat where they sleep. I was looking through my notes and BnB1 was much further along at this time last year than BnB2 is this year (now I have something to worry about). I also read that I had fed them sugar water for more than a month last year and I only fed BnB2 for a couple of weeks (2 qts total) so that could explain the difference. I like them to be able to feed themselves to survive and there is plenty of forage around. I was talking with another beekeeper yesterday and he was saying that some of his hives are slower this year as well. It’s always good to get confirmation that you are not on the tail of the distribution when it comes to how your bees are doing. I had two choices on what to do this morning. Our church is celebrating the 150th anniversary of it’s founding this year and today is the closest Sunday to the date that it was founded. So there was a celebration at church this morning and I found out last night that Diana was going to read the proclamation that she had crafted that the City of Boulder endorsed to celebrate the event. So, as a good husband, I could go to church and be there to support her, even though I’m not much into the whole Jesus worship. Or, I could stay home and peek into the beehives to see how they are doing and worship the Melissae. I haven’t looked inside for a couple of weeks and I wanted to see how much honey they were making. We’re in the midst of a heat wave with temperatures hovering near 100 for the next week, so the only time to go into the hives is early in the morning since the wax gets pretty soft later in the day and is susceptible to collapse. And, since I have a day job, doing this during the week isn’t convenient. You can probably guess which option I chose. When I last looked into BnB1, they had wedded two combs together. They did this last year too (stupid bees!) and it was a source of disasters and impromptu honey harvests when the combs collapsed. This year (being a seasoned beekeeper and all. ;-)) I decided not to try to break them apart, but wait for them to have capped honey and then harvest those two bars. There were 3 bars after that with new comb and honey, so I thought I’d just make sure those were okay and switch some of the smaller combs in between larger ones to make sure they were building straight. The last bar had some good, new straight comb on it looking from the back, but when I went to move it, it was stuck to the bar next to it. I tried to loosen that bar and move them both together, but it was stuck to the one next to it. Eventually, I got the last two bars to move and found that there was a huge chunk of comb that had fallen down and lay crumpled on the bottom of the hive. It wasn’t capped honey, but it was a mess, so I decided to remove it. I had to call in Patrick for reinforcement since I needed someone to brush off the bees for me when I put it in the bucket. He usually sits on the porch and takes notes, so he had to suit up quickly. This is almost what it looked like in the hive as well. Unfortunately, a few bees got drowned – that always makes me sad. I managed to remove the comb, get most of the bees off and clean up the hive a bit. I moved the follower board next to the last bar with comb to help them straighten things out. Hopefully they won’t be too cramped for the next week. It’s supposed to cool down next weekend so I can be a bit more flexible about when I go in. BnB2 was a much easier inspection. They had a cute little comb just starting on bar 14, so I put that in between bars 12 and 13 so they’ll make it straight. I haven’t seen the queen in this hive for over a month, but there is new brood in there, so I’m assuming she’s A-OK. Quick mite board checks showed that things seem to be well on that front. So, we had a bit of comb and honey to process and maybe we’ll get a pint. Since it’s not cured honey, it will ferment quickly, but that’s not a problem in our household since a pint is gone in a couple of days. We process using the crush and strain technique. My able assistant loves to put on the gloves and crush away. I’m going to crush you! The resulting soup of wax and honey is now draining in the strainer. Once most of the honey is drained, I’ll put the leftover wax on a bucket lid and put it out in the front garden (away from the hives) for the bees and wasps to clean up any bits of honey left. Then it’s into the wax melter – should be a good week for that with the heat! We have lots of sunflowers in bloom right now along with butterfly bushes, echinacea, and blue mist spirea – all plants that the bees love. I’ve been enjoying watching lots of native bees and butterflies visiting these and the other plants in my garden. Soon the humming birds will come down from the hills and if we are lucky maybe a monarch butterfly or two will pass through our yard. 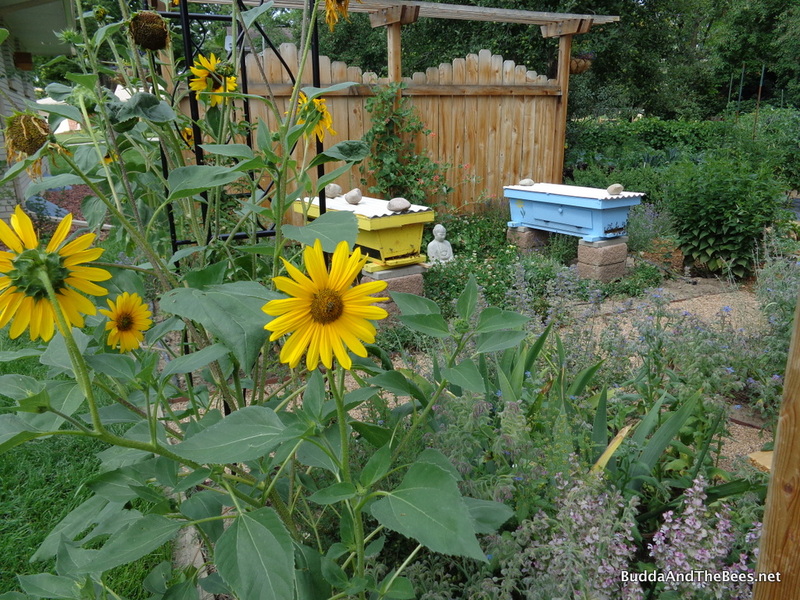 Sunflowers in the bee garden. Super Cool Don! i like your blog and I think BnB1 and 2 are great names. the whole bee thing seems very complicated and time consuming, glad that you are doing this! Thanks, my friend! You’ll have to come by and suit up sometime and look into the hive! I like the names BnB1 and 2, and your hives are just beautiful, too! Lovely hives in a lovely setting — what could be better? It’s so nice seeing your son helping you harvest honey. It’s wonderful that you’re getting a whole new generation involved! Thanks, Julie (but I still think your hives/names are cooler ;-)). 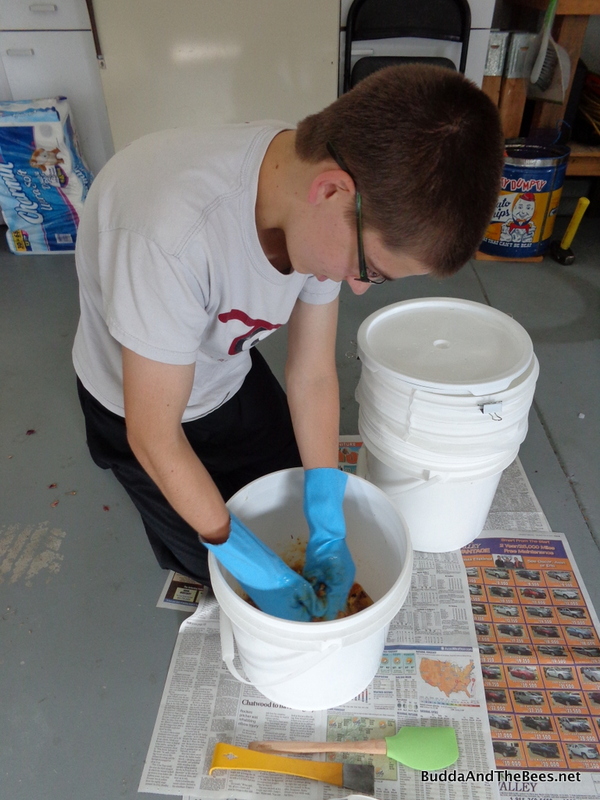 It is fun getting the younger generation involved and he likes to help most of the time. Unfortunately, the bees like to sting him so he’s not as keen on it as he was last year. I liked seeing your son and nephew helping out on your recent post. The more the merrier!